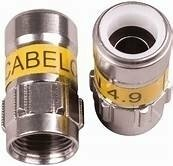 The Cabelcon Self-Install ™ connector is automatically attached to the cable without a compression tool. And you can not take it off! The typical tensile strength is better than the cable specification. Self-Install ™ is also for the professional installer. The electrical and mechanical plug performance meets professional standards. Self-Install ™ is available for indoor and outdoor use. placed in the body part and behind the nut to prevent the ingress of moisture. However, to ensure that the connection from the interface is completely watertight, we strongly recommend installing an external rubber seal.